–>Home loan borrowers got a reprieve this week as mortgage interest rates dipped again, albeit slightly. 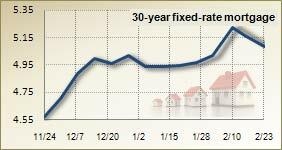 The benchmark 30-year fixed-rate mortgage fell 7 basis points this week, to 5.09 percent, according to the Bankrate.com national survey of large lenders. A basis point is one-hundredth of 1 percentage point. The mortgages in this week’s survey had an average total of 0.45 discount and origination points. One year ago, the mortgage index was 5.15 percent; four weeks ago, it was 4.97 percent. The benchmark 15-year fixed-rate mortgage fell 6 basis points, to 4.37 percent. The benchmark 5/1 adjustable-rate mortgage fell 12 basis points, to 3.93 percent, and the benchmark 30-year, fixed-rate jumbo mortgage fell 6 basis points, to 5.67 percent. The major development has been the civil unrest in the Middle East. The violence in Libya has been especially red-hot on investors’ rate-quote screens since the country is a member of OPEC, the Organization of Petroleum Exporting Countries, which has controlled crude oil output in the region since the 1960s. Meanwhile, the Bureau of Labor Statistics reported that the Consumer Price Index rose 0.4 percent in January. Compare that to last year’s 1.6 percent pace, and inflation appears to be on the rise. Also, the Federal Reserve’s Federal Open Market Committee, which sets the benchmark federal funds rate, raised its growth projection for this year’s gross domestic product to a range of 3.4 percent to 3.9 percent. In November, it had forecast that the economy would grow in a range of 3 percent to 3.6 percent in 2011. The higher revised estimate suggests stronger economic activity. What’s the connection between those trends and mortgage rates? Those ups and downs are “creating a little bit of urgency” among homebuyers, Arnold says, because fears of still-higher rates may outweigh hopes of still-lower house prices. Rates have affected the volume of loan applications, which dropped 9.5 percent in the week ending Feb. 11, only to rebound 13.2 percent in the week ending Feb. 18, according to Michael Fratantoni, vice president of research and economics at the Mortgage Bankers Association in Washington, D.C.